Well hello there friends!! It's always hard to get going on a Monday after a holiday - especially one that involved lots of relaxing, eating & indulging in all things holiday!! We managed to squeeze in quite a bit in the few days off we had - here's what we got up to! As to be expected we ate a lot this weekend! 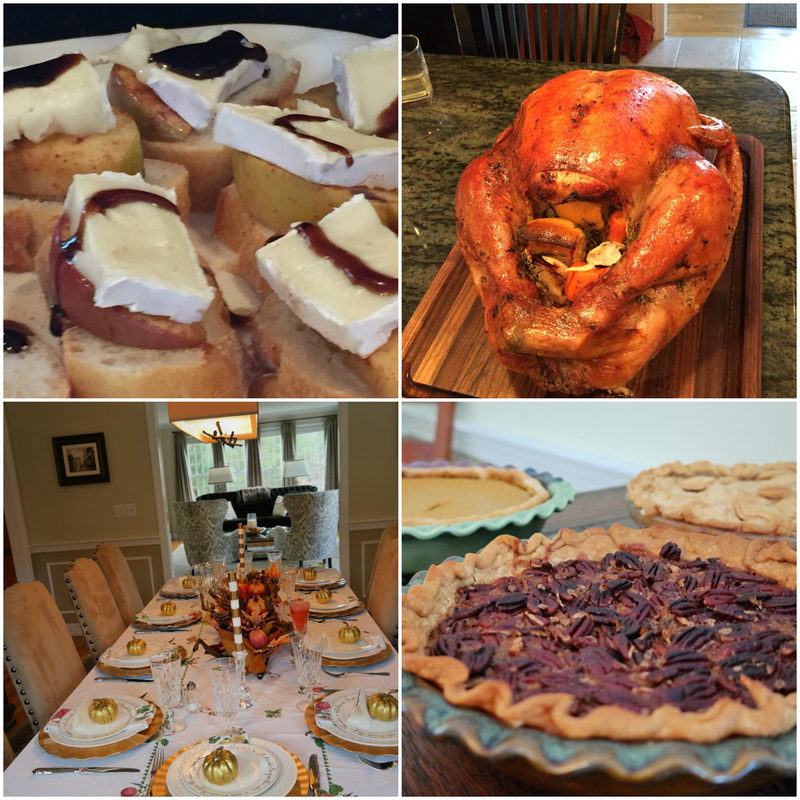 The turkey was cooked to perfection and the apps that I mentioned last week were a huge hit! My sister outdid herself with a beautiful tablescape and food that was amazing! But of course we couldn't just stop with Thanksgiving food. Although I wish I snapped a picture of my BIL making good use of the turkey leftovers and made some Turkey Quesadillas! 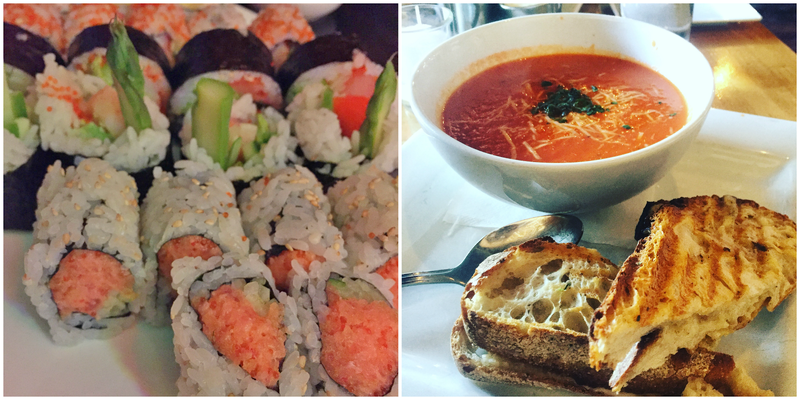 We had lots of comfort food and if you don't consider sushi to be a comfort food, then you just haven't eaten at our favorite place!! We watched a ton of movies this weekend - I feel less guilty when I know I've gotten so much off my to-do list!! Our favorite of the weekend was Creed. I wasn't sure what to expect, but it was really well done! Fun fact - I'm obsessed with all the Rocky movies - especially IV! It also didn't hurt that we watched the movie in the newly renovated Fenway Theater and the best part is the ticket prices were still at the as pre-renovation! Honorable mention goes to Self/less with Ryan Reynolds. It had similarities to a few other science fiction movies, but I liked that it steered clear of the science portion and dealt with the story more. I was so happy to put away all things Fall and get into the holiday spirit!! We wrapped, put up our decor & even managed to send out our Holiday Cards! I'll be sharing them this week! I did most of my shopping online with the exception of Friday afternoon - but I was happy the outdoor mall wasn't packed! I scooped this fun plaid top from Express for myself, but the rest of my shopping was done on the computer!! And I have to tell you - shopping online is the best! How was your Thanksgiving? Will you be shopping any Cyber Monday sales? Link up with me and Meghan to share! Perfect Holiday weekend!! The family pics are gorgeous, my fave is the one of you and your sissy!! So so beautiful!! Family, Movies, decorating, Christmas cards and online shopping, my kind of life!! LOVE the plaid Express top you got too! Have a most happy Monday lovely lady!!! Sounds wonderful turkey quesadillas sound awesome!! Haha food use of the turkey leftovers for sure! I'm all done shopping for now..! I've spent so much on myself this weekend lol.. Happy Monday! Looks like a fabulous Thanksgiving, lady! Yum to all the food and CHEERS to Christmas cards, just like me! :)! I love the food y'all ate for Thanksgiving! And I'm so impressed you've already sent out your Christmas cards! I need to hurry up and address mine! Those sales were crazy this weekend!!! Go you on the Christmas cards already being addressed and ready to go out! You know Im impressed! It looks like Thanksgiving was a success and the rest of the weekend was perfect too! We had plans to go see Creed with friends, but didn't end up making it with Coop being sick. Glad to hear it was good! Hope Monday is good to you! The turkey looks fantastic !!! Love all the photos :) Glad that you had such a wonderful Thanksgiving ! What a perfect Thanksgiving weekend!! Perfect mix of family time, good food, relaxing and crossing things off your to do list! Sounds like you had the perfect holiday weekend!!! I wish I would have thought about getting group shots on Thanksgiving. Maybe I will be better about it at Christmas! All of the food looks wonderful! And go you for getting your cards done! Mine came in last week so I need to start working on them. Happy Monday! That sushi looks great! I'm hoping to snag a holiday card deal today with all the cyber Monday sales because I've has my eye on one for way too long! Happy Monday! That Thanksgiving tablescape was absolutely gorgeous! She really did a great job! I don't know if my wallet can handle anymore sales! Glad you enjoyed your holiday break! Sounds like you had a wonderful thanksgiving! The table looks so beautiful and I am so impressed that you already sent out your Christmas cards! Looks like an awesome holiday weekend. I love the theatre with the lounge chairs, I would totally be afraid of falling asleep though. Yeah for getting your cards out. It sounds like you had a wonderful Thanksgiving with your family, and all of that food sounds and looks so amazing! I wish that we could've gone to the movies at least once over the weekend, but there wasn't a theater close to us. Those seats in that theater, I don't know how you didn't fall asleep during the movie! i couldn't get enough of your fab thanksgiving photos! what a lovely day that turned out to be. and sushi is for SURE comfort food to me! brb while i go shop all the sales! happy monday girl! I love that coffe mug and what it says. You guys had a yummy foodie weekend. The sandwich with tomato soup and turkey look sooo good. I haven't been to movies in forever and I want to go. Love that top from Express and I must own it too lol. Gorgeous bracelet also. Happy Monday! Looks like an awesome weekend and love that plaid top!! Online shopping is the only way to go for me.... crowded places just aren't for me! 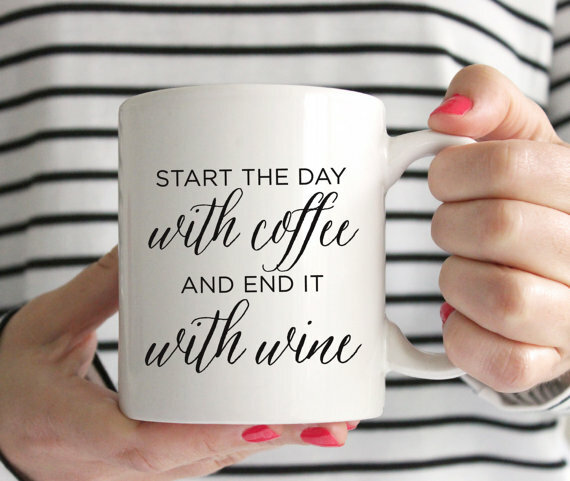 LOL - that coffee mug was MADE for me! Looks like such a fun weekend! Your sister's tablescape was beautiful! And yes, sushi is TOTALLY comfort food! I can't wait to indulge with a big glass of wine in just 5 1/2 months. ;) Ha! Have a great week! So glad you had an amazing Thanksgiving! Your sisters table looks so gorgeous! Yay for the holidays finally being here! I only got some of my Christmas Decor up since we got home late last night! I can't wait to get home from work today and put the rest up! So So excited! Ah such a lovely holiday!! So glad the appetizers were a hit! What fun pictures! Those appetizers look amazing! Love your wonderful family photos and your gorgeous table setting!! Your photos are marvelous and the food looked scrumptious!! Love the family photos! We have a local movie theater here that had a reno like that with the same kind of seats, nice they didn't raise your prices! Ironically, I am watching The Today Show and they were just talking about "Creed" as I was reading this! Tamron Hall said Sylvester Stallone should win an Oscar, wonder what you think? Also, they said the five minute fight scene was filmed in ONE TAKE! I might have to see this! Such gorgeous photos! I did a lot of movie watching this weekend, too. We saw Hunger Games, which I loved! Yay for a great weekend! Looks like Thanksgiving was a wonderful affair. Your sister's home is absolutely gorgeous. Beautiful pictures. Ok, can we discuss that gray bag of yours (at the movies)?? It's fantastic. Whose is it? I think I need it in my life. haha add it to my ever growing Christmas/Bday list. Glad you had such a great Thanksgiving! Beautiful place settings :) I'm making my return address labels today and then my cards are out! Good job on being done already! Happy Thanksgiving, Biana! You look like you had an amazing weekend. Happy monday! This sounds like the perfect holiday weekend!!! Thanks for sharing! I can't wait to see your holiday cards!! All that food looks delish, particularly the soup! It's been chilly, damp, and gross here for days so the only thing that sounds good is soup!! Thanksgiving looks so yummy! I was in Hawaii and didn't get turkey or stuffing...bummer. Looks like you had a fun filled Thanksgiving weekend! I'm so sad it is Monday and I am back at work :-(. Have a great week! 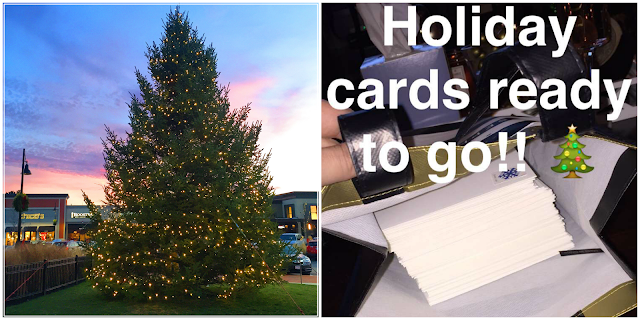 We got our holiday cards out this past weekend and I was seriously SO proud of myself haha! We've had them ordered forawhile and I was just happy to get them off my counter! /looks like a wonderful Thanksgiving celebration! Hope this Monday is being kind to you! Looks like you had a fabulous holiday weekend!!! That sushi has me craving it...I haven't had some in SO LONG! Yum! And another fellow fan of Creed over here, too. After watching all the Rocky movies recently, I love them, too! They are so good! Your sister's house looked gorgeous for the holiday, all those photos of your family are beautiful, too! :) I'm so jealous of your fancy movie theater, and I'm glad to hear that Creed was good, I've been intrigued by the previews. Hooray for being finished with holiday cards, I finished mine, too and plan to mail them tomorrow! I would love to see Creed - I never tire of Rocky movies either. I gotta find a theater where I can melt into a comfy chair! Um, yes sushi is totally a comfort food! Glad you were productive and relaxed with a movie marathon as well. Those are the best weekends! Creed is on our list of movies to see too. Oh my goodness your thanksgiving food looks so yummy!! and that coffee mug is adorable! Looks like you had a fabulous thanksgiving weekend! So festive and fun! That turkey looks scrumptious!! Looks like such a great weekend! Love that coffee mug! Looks like so much fun! The table for Thanksgiving is set beautifully, I love it! Online shopping is where it's at!! What a fantastic weekend! When you posted that picture of the grilled cheese and tomato soup on IG this weekend my mouth literally watered. So delicious! oh no, H&M is having a sale + free shipping? that is so dangerous. i am trying to be good, i spent so much on thursday / friday, mainly online. the sales were too good! good to know about the ryan reynolds movie, i wanted to watch it and KC did not. oh man, sushi is so a comfort food! i have been craving my favourite place for ages now, looks like we'll have to make it happen soon. 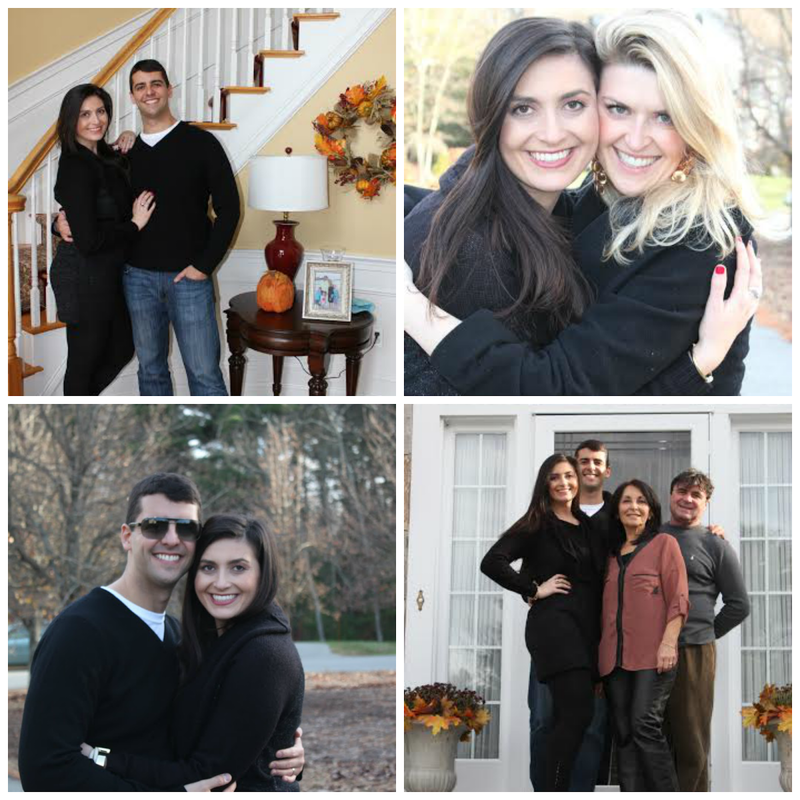 love the photos of you and your family from thanksgiving! Yum!!! Sushi on Thanksgiving? I need to come visit your family! I love it!! ;) it really does feel great to wrap up Fall and get out all the holiday decoration!!!! Everything looks so great!! I've heard really good things about Creed, but I haven't seen the other Rocky movies, so a lot of it might be lost on me. Have a great week! That theater looks awesome! There are a few in this area like that, but I haven't been. Love that you got a lot of family time. It's the best. And yes to sushi being comfort food. It's definitely one of mine. Your thanksgiving dinner with family sounds amazing and the turkey looks huge. Perfect for lots of leftovers and to recreate different recipes. I'd love to try the sushi at your favorite place. What's your favorite roll? I always go for the volcano rolls and switch up the rest. I feel so behind on holiday cards! You're the second person I've read about who's gotten out their cards. We just got ours taken Saturday and finalized Sunday. We just ordered ours. I can't wait to see them! I'm sure they'll beautiful! Your thanksgiving is definitely one I'm envious of. Sushi, turkey quesdillas and everything in the pictures? I need that in my life. Kyle and I almost considered eating chinese food for Thanksgiving just to change things up. I did so much shopping on Black Friday, and I'm checking out places today for finishing up some Christmas shopping, thank god for sales because I spent a good chunk of money already. Looks like you guys had the best time! And that coffee cup is amazing! Turkey quesadillas are a great idea! And sushi can be true comfort food ;) The place you go always looks delish! Looks like a really nice Thanksgiving! My mom and I spent a few hours out on Friday morning, and the mall wasn't too terribly crowded. 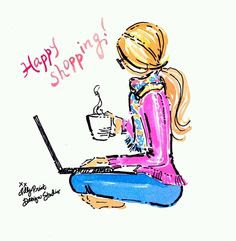 However, I finished up almost everything today with online shopping! Gotta love those cyber monday deals! I totally failed on getting pictures of people this weekend! I think I just had too much food on the brain. Your meal and time looked amazing, and I've been excited for Creed so you just added to that. Happy Cyber Monday! Thanksgiving looks like it was perfect! I am still stuffed. So jealous your cards are ready to mail...I still haven't gotten mine finished. Have a great week! All that food looks amazing! Now I want pecan pie!! Glad you had a great Thanksgiving! Your sister did an AWESOME job with the table... I love the little pumpkins!! I'm totally intrigued by Selfless. Good enough to see in the theater or wait until it's at Redbox??? Your Thanksgiving looked amazing and I love how your table decor!! What a fantastic Thanksgiving - the tablescape by your sister looks gorgeous and all the food so delicious! Jealous your cards are already sent out! I just need to find some time to address ours this week then hopefully get them out! Looooving that mug :) and yes, why is the first day back to real life after holidays always so much harder than a regular Monday!? Glad you had a great long weekend! I absolutely love that mug - so perfect :) Your spread and table both look aaaamazing!! Glad you had a wonderful Thanksgiving! I do my shopping online as well! I feel like I didn't spend anywhere close to what I actually did since they haven't come in yet haha. That food looks so yummy, can it be Thanksgiving again this week? Oh my goodness, I love that mug so much! It's so cute! Lovely pictures, it looks like you had a wonderful Thanksgiving :) The food looks DELICIOUS, you have no idea how hungry you made me, especially because sushi is my favorite food EVER! Have a great day! Your family's Thanksgiving table was so beautifully set. And OMG you look so comfy in that movie theater haha wish I could find one like that in my area! I'm so jealous your cards are done! Every year I send mine out the day after Thanksgiving and we were traveling this year, so I haven't even gotten our photos taken yet! EEEK! Creed is on our list of things to see! Your sister's tablescape is beautiful!